‘My mother didn’t tell me we were leaving my father until we were on the plane from California. I was only five, I thought we were just going on vacation, and she brought me here to New England.’ Nate told me his story while we painted a cemetery fence in temperatures so hot the coating never lost its stickiness. It was our summer job after freshman year. It was as if he was swearing in the aisle of a transcontinental plane again, utterly pissed off at an injustice. Nate himself died in a car crash a few years after graduation. Recounting the story of Milja’s death in my earlier post, Nate and his seemingly heartless comment was an aside, almost making him the villain. But put together with the trajectory of his life, with the fact he met a similar untimely end, he takes on a new dimension. In my previous entry I wrote about how we select our characters and try to portray those most hurt by a situation. But I also argued for ensuring we illuminate those who help, and those who look on. We need to accept that we ourselves aren’t always the victims, and find constructive ways to react. That’s why we shouldn’t rule out ‘unlikeable’ characters. To help examine why we need characters who aren’t just ethnically and socially diverse, but also diverse in personality, I spoke to author Helen Taylor. Helen recently published her first novel, The Backstreets of Purgatory. Set in contemporary Glasgow with a guest appearance from the artist Caravaggio—sometimes fun, sometimes thoroughly disquieting—the novel follows Finn, a frustrated and somewhat entitled art student, as well as some of the people in his orbit. The story unfolds through 4 points of view, including Finn’s. It’s a raucous ride, and although all the characters make mistakes that hurt each other, they are warmly portrayed. We understand that the poor decisions come from pain or insecurity. Last week, Helen provided me with insight about tempering gritty realism with compassion—and vice versa. Question: How did you assemble this crew? Did you add or enhance some characters for balance? Helen: Finn was the first character I had and Kassia the next. The others evolved from them (almost as a way of fleshing them out). Tuesday McLaughlin arrived and stormed on to the page, fully formed. In the end, I chose the strongest voices for the 4 POVs. The challenge came in ordering their voices in the chapters and achieving a balance between the competing perspectives. Question: In a way that makes sense, because Finn and Kassia are basically opposites. It’s as if they need each other to exist in fiction. Finn is the one who interacts with Caravaggio, and he catalyses change in the other characters’ lives. Is he inspired or imagined? Did you enjoy writing in his voice the most? Helen: Finn wasn’t dissimilar to a character who starred in a short story “The Kiss” I published in The Ranfurly Review several years ago. He’s purely fictional, but the fact he has popped up twice makes me think he must be inspired by someone. Although it pains me to admit it, because Finn isn’t the most likeable character, there are elements of me in him. Writing in Finn’s voice allowed me to explore ideas about art and mental health. As the novel progresses, Finn’s language becomes increasingly elaborate and his thinking becomes erratic with loose connections. When I wrote those sections, it was like taking a stopper out of my brain and letting the contents flow freely. It was great fun. Especially inventing words. It was much less fun towards the end, though, as things take a dark turn. One chapter had me in tears as I wrote it. Question: So maybe writing our characters’ weaknesses helps us come to terms with our own. Did you feel pressure to make Finn or other characters “likeable?” What aspects were added or smoothed over to make them relatable? Helen: Rather than feeling a pressure to make my characters likeable, I felt it was important that even the most seemingly nice of them had flaws. What I did find extremely difficult was having the characters say things I wouldn’t say myself. There are a few phrases that are casually homophobic or racist for example, which make uncomfortable reading despite being said (or perhaps because they are said) as part of the “banter”. It was worse when these things were said by characters I’m fond of (Tuesday and Maurice, for example). It took effort to leave them in because I worried that readers would think they reflected my own opinion or way of speaking. It was a tough decision because, in theory, I am in control of how my characters speak and act. Question: I love your perspective on ensuring characters have flaws. All your characters are vividly flawed, but Finn is particularly self-absorbed. How do people react to his character? Helen: There are readers who don’t like him at all, and those who are exasperated yet feel sorry for him. I’ve become more protective of him as time has gone on. Yes, he can be a total prat, yes, he is conceited and yes, he behaves appallingly. But, at least at the beginning, he recognises some of his flaws and can take the micky out of himself. And I would argue that his cruellest actions arise from good intentions that go wrong because of lack of insight. The difficult truth is that many mental health conditions can make people self-absorbed and lacking in insight or empathy. Mental illness in all its forms can make people’s behaviour unreliable, can alter their relationships, and can fuel paranoia and feelings of persecution, whether that be schizophrenia, personality disorders, bipolar disorder or depression. I speak from personal experience. We can be hard to live with. Question: You’ve done a great job of establishing the characters’ goals, and sharpening their needs with backstory, and that really engaged me in the plot. How integral were all those dreams and affections from the start? Helen: As soon as I’ve established the basic characteristics of the principal players, I work out what their goal is, what challenges they will face, how they will overcome them (or not) and how their personality will be changed. Although I plotted The Backstreets of Purgatory in detail before I started, the story changed as the novel progressed and the drafts were rewritten. But I always had in mind that each character had their own trajectory and that they shouldn’t — they couldn’t possibly — reach the end of the story unchanged. 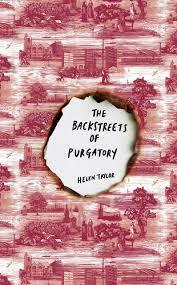 I’m very grateful to Helen Taylor for talking to me about characterisation and The Backstreets of Purgatory. I thoroughly recommend the book, available from the Unbound website (and you can check out what other projects you personally might enjoy helping to get published). It’s been great fun to get behind the scenes of a good novel, and to reaffirm our right to write not-so-pleasant characters. Sometimes they’re the ones that stick with us—as Nate always has for me, and as I suspect Finn will for many. DeBunked: A cunning plan to keep certain tiny, fake-tanned fingers off the nuclear codes! Free story when you sign up to the email newsletter.